let’s heal the divideis a site-specific work for VCC Downtown Campus that reflects upon the history and current conditions of Vancouver and addresses the socio-economic, political and cultural points of disconnect present in the area. 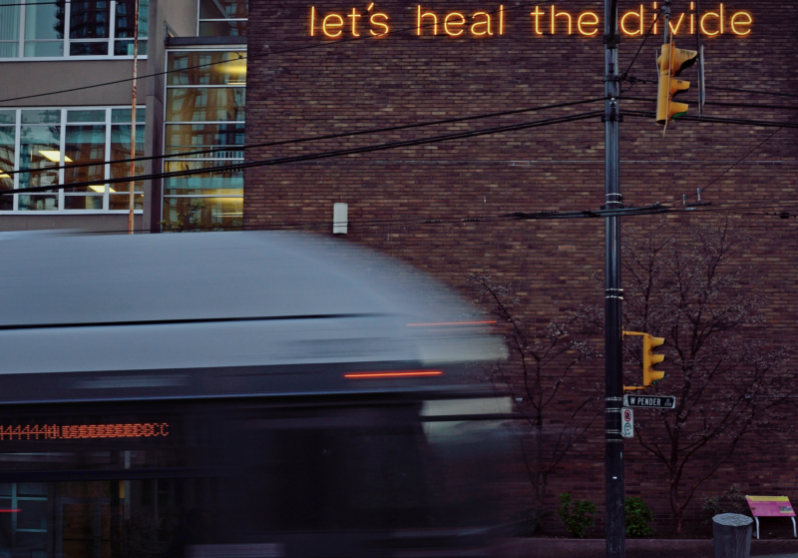 The site-specific neon work, hung on the façade of the Vancouver Community College building, marks a physical division between the Downtown East Side and the commercial and financial districts that border it. 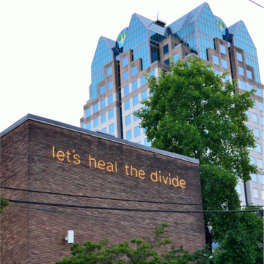 The location of this work highlights the glaring economic disparity between neighbourhoods and acts as an intersection between perceived borders. It marks a physical division between one of the most impoverished postal codes in Canada and one of the wealthiest. The artwork prompts us to question the sometimes arbitrary lines that divide us. 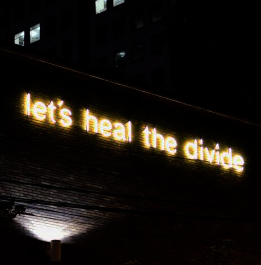 In the spirit of hope, this piece calls for action, collective healing, connectivity, and inclusion. The artist, Toni Latour, will be speaking about her work. Toni Latour is an East Vancouver queer feminist artist who works in photography, installation, text-based practices, drawing, video, sound, public and performance art.